Could you tell if there are other Government bunkers, dangers for common people in Russia, exept Urals? Rumors are about Altai, mountains in the East, that will also stay safe. The Altai mountains stand where four countries touch - Russia, Kazakhstan, Mongolia and China. This is high land and can lead a survivor in many positive directions. One direction, within Russian territory, is along the Russian mountains, past Lake Baikal, and onto the new Equator at the Bearing Straits. Another direction would be down into Mongolia which likewise will do well, with a temperate climate and a desert that will bloom in the Aftertime. The highlands of China and Kazakhstan are likewise possible directions, and as they will remain temperate highlands and are agricultural today, so will not disappoint. Is the Russian government planning an alternative site in the Altai Mountains? They have put their all into the Urals, as they clearly have withstood cataclysmic changes in the past and are solidly within Russian borders. The Altai are, relatively speaking, exposed. This leaves the mountains of Russia, leading to the new Equator, to survivors among the common man. These mountains are relatively cold and barren at present, not populous today, thus there would be less crowding after the pole shift. This whole swatch, high land all of it, will be within temperate or tropical climates in the Aftertime. The Russian government would be advised to tell their people to take this trek, should they be inclined toward honesty and disclosure about the coming passage. The Zetas commented last week on the Queen's meeting with Obama and the fact that she is still trying to find refuge when she needs it but can the Zetas comment on what the face-to-face meetings between Obama and Cameron were about? They must have surely discussed the pole shift as happens with these face-to-face meetings and the Zetas have previously commented on Cameron meeting with all the Baltic leaders to discuss such things. Are they considering an announcement now that the 7/10 events have obviously started (although kept out of the news). If they don't, they must surely appreciate that if they don't, events will overtake them and they will look as complicit in the coverup as groups such as NASA will? Both disclosure on the alien presence and the obvious need to formulate a plan whereby the populace is told about the near presence of Planet X and the pending passage are hot items. Britain is one of the countries pressing the US to open its UFO files and go a step further to admitting the Roswell incident. As we have mentioned, there are those within the establishment who feel that help from benign aliens would be provided during the coming times if the populace were able to greet the visitors without fear, and they, the establishment, would benefit from such an assist. This group is countered by the many who fear disclosure. During disclosure, all countries involved in the cover-up want to minimize damage, appearing as credible during future government pronouncements. This leads directly into the issue of the cover-up over the near presence of Planet X. It is inevitable that the common man will see signs in the sky that are clearly not caused by Global Warming or solar flares or the ozone layer. The Sun and Moon will be so out of place that reassurances and explanations from NASA won't suffice, and finger pointing will begin. The big lie will be exposed, even if not admitted, and the Internet searched for alternate explanations, all arriving at ZetaTalk. During its 15 year life, ZetaTalk has spread around the world, and is on so many message boards, in so many archives, and on so many personal computers that it could never be erradicated. Fixing blame for the cover-up is just one of the problems, as every country participated, every administration participated, and the common man is not so easily duped that they would buy that NASA and NASA alone perpetrated this cover-up. However many options are thrown about - from assigning blame to the politicians who ordered the cover-ups in the first place to explaining the rationale for denying the public the truth - the issue is never settled. Hand wringing goes on. Rehashing the options goes on. And meanwhile the plate movements in the 7 of 10 scenarios pick up speed. What represents this recent picture at The Sanctuary, Nr Avebury, Wiltshire UK ? http://www.cropcircleconnector.com/2011/Sanctuary/Sanctuary2011a.html [and from another] The circle has changed! This genuine crop circle has been modified by the makers a day after it was first laid, for emphasis. This is a timeline image, as most linear images are. Clearly, in the center, something almost violent has occurred, a sense of a vertical flip. 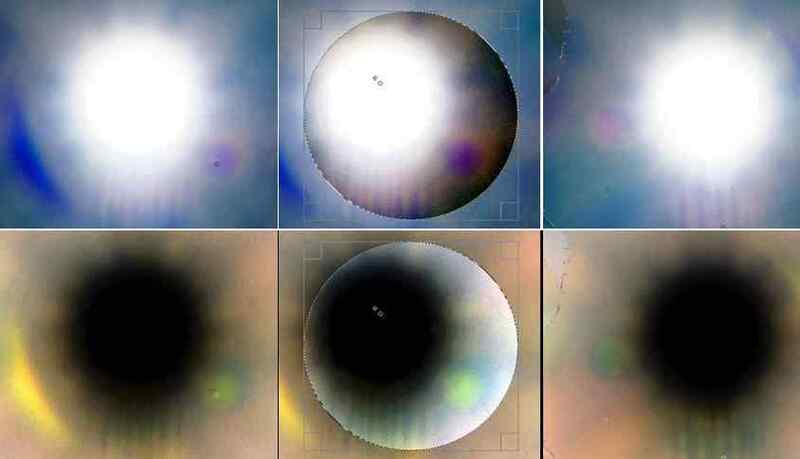 Starting from the left, the two circle-within-a-circle orbs show an attempt to escape, caught in the larger circle, pressed to the side. The progression shown by the addition to this design emphases that attempting to escape by changing position, the flip, will not work for long. 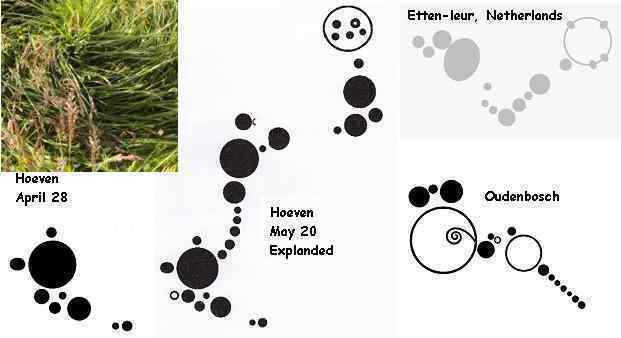 This crop circle relates to the planets caught in the cup - Venus, Earth, and the Dark Twin. Venus will seem to be out of place and then loom close to the Earth. The Dark Twin, which normally follows the Earth in their shared orbit, is currently outside their shared orbit, further out in space. It may even move ahead of the Earth, temporarily, before being squeezed out of the cup to escape. "Ex-presidents" return to Haiti and Honduras. Is this a sign that the "elite" believe the Zetas now? The resources and power they sought to control will not survive so they are allowing the truly elected back to deal with the people while they flee? [and from another] http://www.euronews.net/2011/05/29/triumphant-return-for-honduran-ex-president/ Having lived mostly in the Dominican Republic since his exile, Zelaya returned after signing a deal with current President Porfirio Lobo. It paves the way for Honduras to normalise ties with other Latin American nations, several of which have been reluctant to recognise his successor. The country was plunged into chaos in 2009 when Zelaya was deposed by the army, acting on a court order with backing from Congress. [and from another] http://www.npr.org/2011/03/18/134664541/Former-Haiti-President-Returns-From-Exile Thousands of dancing and cheering supporters greeted Jean-Bertrand Aristide, as he returned to Haiti today after seven years in exile. Aristide's return complicates this Sunday's presidential election in Haiti. Two candidates are vying for the office that Aristide won twice and was deposed from twice. Neither of the two candidates are supporters. They're much more to the right of Aristide, who is a very populist leftist, very popular among the poor here. [and from another] Yes, Zelaya was legally elected, but he planned on staying above and beyond the stipulated time limit. What were the people supposed to do, let him just stay and keep serving as president? Doing so would have meant that the Rule of Law, their Constitution, meant nothing! The return of these two ex-presidents at this time, both popularly elected and ousted by ultra-right factions, is no accident. Haiti has always been a handy drug transport stopover, where the CIA and other factions garnering funds from drug running could rely upon the grinding poverty in Haiti to facilitate their operations. Local officials were bribed to look the other way, as were any citizens nearby. Aristide had too much integrity to cooperate and thus was literally kidnapped by the CIA and removed, as an assassination would have been too inflammatory. They did not want a martyr, nor was Aristide willing to die at that time. Zelaya likewise was a popularly elected president, who was removed by ultra-right factions. This popular election was, in essence, a referendum by the people to change the Constitution on term limits, but this was ignored. The recent changes in Haitian and Honduran politics is related to the trend toward democracy that has swept S America during the past decades. Those in the Service-to-Other have pushed corporate control and ultra-right politicians out of government in country after country in S America. This is sweeping north across the Caribbean and Central America, and threatening these ultra-right elements in Mexico. A second factor in the return of these two ex-presidents - Aristide and Zelaya - is the increasing Earth changes making these lands less desirable as a base of operations for the ultra-right. Even if not frankly in the know about the pending passage of Planet X, these factions see poverty increasing, assets threatened, and cast their gaze on more favorable locations. They are moving on! The leaders of China, Japan and South Korea met in Tokyo on May 21-22 and it appears to me that they are discussing strategies on how to work together during the upcoming poleshift. May I have Zetas thought on this matter thanks? [and from another] http://www.koreaherald.com/opinion/Detail.jsp?newsMLId=20110529000205 The leaders of China, Japan and South Korea met in Tokyo on May 21-22 as scheduled. The separate visits by Chinese Premier Wen Jiabao and South Korean President Lee Myung-bak to the earthquake stricken area on May 21 conveyed the two countries' deep sympathy and respect to the victims of the disaster. The three main players in East Asia also agreed to accelerate trilateral negotiations on investment and research for the China-Japan-ROK free trade zone. They also decided to expedite custom procedures and expand air routes to improve trade and personnel exchanges. The first summit of the three countries was held in 2008, upgrading regional teamwork and deepening cooperation. The United States and Russia were invited to attend the East Asia summit in October 2010, turning it to an increasingly important multilateral meeting. Where China, S Korea, and Japan have many legitimate regional considerations demanding cooperation, there is of course a pending pole shift aspect to their conferences. We have mentioned that the sensitive issue of the pending pole shift is discussed only face-to-face and not via electronic or written communication which could be intercepted. Thus, these conferences provide great cover for such conversations. These three countries are all populous and industrialized, and none is exempt from devastation during the coming Earth changes. In particular, they each understand they will be dealing with refugees from elsewhere, seeking asylum. China will suffer less from tidal waves, though its long coastline, where the populace lives in the main, will be devastated. But China has a long land border with southeast Asia, which is clearly suffering from the flooding ZetaTalk predicted. They anticipate immigrants flooding over their borders, demanding to be fed in a country that struggles to feed its own citizens. S Korea fears increased hostility from N Korea, where the heavy-handed dictatorship ignores its starving citizens. Where Japan is included in such regional talks because of its industrial status, it is a prized member of the conferences primarily because of its relationship to the US. All hope, somehow, for rescue aid from the US. Beyond this hope, they have scant practical plans. This video was taken with an expensive camera, a point the poster touts with pride as he announces his discovery. He takes his audience through the steps by which he examines his video with color enhancements. The captures are genuine, despite the poster now claiming he thinks they are lens flares. Not all who capture evidence of Planet X and its Moon Swirls can withstand the heat they come under when they go public. The large orb at 4 o'clock, which the poster correctly identified as the prime suspect, is the Planet X corpus itself. There are Moon Swirl orbs likewise in view, at 9, 11 and 2 o'clock. These orbs are caused by Moon Swirls turned so their tubes are in a line from the Sun, thus funneling light down their tubes like a flashlight. I am currently living in the geographical center of Argentna and I would ask about a possible security zone for the time shift. The zeta announced that a huge amount of water from the Atlantic barrier deep inside the South American continent, leading to secure the foothills of the Sierras de Cordoba and the mountains of the Andes, with the risk present in these latter by the creation of new mountains. My intention is to move toward a mountain range between the two areas mentioned above. The hills of San Luis have good height (1600 meters above sea level) to avoid being swept by the tsunami and floods following the shift. Geologists have a volcanic origin of many millions of years because the Pacific plate that is subducting under the continent horizontalis at this latitude, resulting in the formation of some volcanic mountains in fault zones. There is evidence that man lived in caves in the area for 10000 years. The question is, volcanic phenomenon can repeat this in the area after a long time for the next shift? The question arose when trying to figure out because there was volcanic formations in the middle of the continent and not just on the western edge. If raised millions of years ago was more than likely not to repeat the event. In Argentina, between 27 ° and 33 ° lat. S, the subduction zone with angle of 30 ° passes then a 5 ° tilt. Giving rise to volcanic front may reach a maximum of 700 km. When I met these details I found that expulsion of lava could occur in fault zones due to rubbing of the plates for the predicted movement of the continent. We have already stated that the Cordoba range would be a safe zone, safe from the tidal waves rushing in from the Atlantic. Hot springs appear in many places around the world, where the crust is thin, primarily due to stretching. 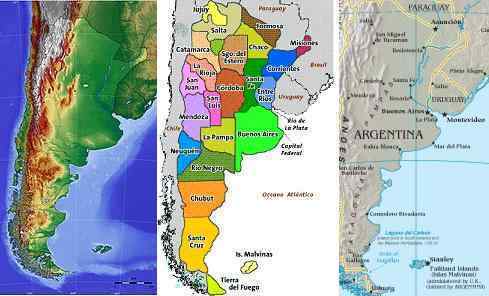 Argentina, at Buenos Aires, will experience stretching as the top part of S America is pulled to the west while the tip of S America is nailed firmly at the Antarctic Plate. The bay at Buenos Aires will rip open, as we have stated. Thus inland, in San Luis, there are hot springs. This will not result in volcanic eruptions during the pole shift. 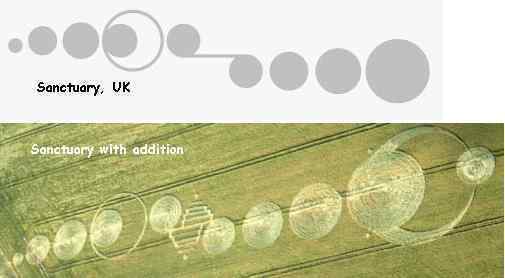 The clue to interpretation of this stunning crop circle is the emphasis on 3 parts, which we have stated refers to the magnetic trimesters. Almost equal in duration, occuring apprximately four months each during the Earth year, they differ in strength. This design is relating them to the wobble, and the pressure the Earth is under while attempting to lean her N Pole away from the magnetic hosing from Planet X. The trimester ending in April is the mildest. This is followed by the strongest trimester, the Summer trimester ending in August, during which the wobble will be most forceful. Then the force eases for the Fall trimester ending in December. Would you tell us some words about recently appeared circles: 5.23.2011 Etten-leur, Noord Brabant, Netherlands http://www.cropcircleconnector.com/inter2011/dutch/EttenLeur.html It look like the previous two, from Hoeven and Oudenbusch. Is about particles crowding too? And another is from Novoaleksandrovsk, Stavropol, Russia 5.30.2011 http://faktorvremeny.wordpress.com/2011/05/31/v-stavropolskom-krae-krugi-na-poljah/ [and from another] Hoeven http://www.cropcircleconnector.com/inter2011/dutch/hoevan2011c.html With April 28 - May 20 progression. Oudenbosch http://www.cropcircleconnector.com/inter2011/dutch/Oudenbosch2011.html May 12, 2011. The Stavropol design specifically relates to its location in Russia - between the Caspian and Black seas. As the Arabian Plate shifts during the 7 of 10 plate movements, the pointed top will tumble the oil fields of Iraq, as we have so long predicted. The moving point, like a sickle, will apply pressure to the lands between the Caspian and Black seas first from the west, then arriving at the eastern side of the point to apply pressure there. Since the areas where the circle was laid is not on a fault line, this will be confusing for those living there, and this crop circle seeks to give them a clue as to the cause of their earthquakes and land adjustments. The Netherlands has been host to a series of unique crop circles, laid by makers intent upon relaying a heretofore unstated message. It is hoped that by clustering these circles in one location, in a country normally not the center of focus during the crop circle season, the message may get better focus and attention. The progression at Hoeven shows the status of the 270° roll, with April 28 being the current status, Planet X having turned 180° to point its N Pole almost directly at the Earth. May 20 shows the full 270° roll with Planet X standing upright during which time it engages the 3 planets caught in the cup including Earth with her Moon. Then Venus escapes and the Moons of Planet X enter the picture. Oudenbosch is showing this from a different perspective. As Planet X approaches the 3 planets in the cup, the rotation of Earth in her counterclockwise manner creates a clash with the other planets. In this they are not given equal weight, as the rotation clash is primarily with the Earth's Dark Twin. Etten-leur is telling the tale of the Dark Twin, from the point at the left where it is caught in the cup with the Earth and Venus, to its escape out into space behind the Earth. The Dark Twin then wants to return to its orbit, and does so with a sharp 90° turn, thence moving in the normal counterclockwise orbit, coming closer to the Sun again. It then finds itself gradually positioning itself on the opposite side of the Earth in their shared orbit. Are crop circles really drawn for us? It seems that we can't understand them directly or we may misunderstand them without Zetas' explanations. If they are drawn for us, why so hard to understand? Same as telepathy message. It seems those people who saw the UFO didn't receive the message, as no one declared such things. How can we receive it if some UFO come to send messages? By meditation or just sleeping? [and from another] I´ve studied and tried to decipher several crop circle formations for months, by using both ratio and instinct. However, even after somebody has explained what they mean, I still can´t make sense out of them. Nonhumans chose to limit their one-way communication with humans to crop circles, a language whose grammar, syntax, semantics and even the alphabet and unknown to us (whereas the binary system, dance, music and math are universal). If most people have no clue what message is inside each crop circle and any guesswork is ambiguous at best, then maybe the subconscious alone isn´t efficient enough to process it, we have the will to understand but there is some other, necessary element missing in us. A message understood by the sender but not by the intended receiver means that the whole purpose of the exercise is defeated. Or are the messages meant only for a selected few who have been given the key to understand them, in which case why not send the intended few the message directly instead of going to all the trouble to lay them out carefully for everybody to see? Weather forecasts and a timetable for decades after the PS, said to be conveyed by the circles, are the most valuable intel of all time; such info would usually be suppressed by TPTB as a means to control the masses and resources. If TPTB are aware crop circles convey information that is priceless for survival, why do TPTB allow the circles to remain in place instead of rushing to film/record them and then blur or outright destroy them so they alone can use the info? Or do the crop circles convey their message hidden within a visual "white lie" to throw them off track, while allowing normal people (that is, those lucky chosen who know how) to get the true message? Those who complain they are not aware of telepathic messages, or not aware of what their subconscious is trying to tell them, are having an internal battle where the finger of blame can only be cast upon them. The messages are delivered, the subconscious receives it. The subconscious, as with all it experiences, never forgets or confuses the issues. It is the conscious that is the problem, and in particular the conscious in those people who play denial games with themselves. The husband is having an affair but the wife chooses not to notice the late absences or the odd stains on his clothing. The family is living beyond their means but rather than face this and make adjustments father ignores the rising pile of bills and even splurges on new toys, in angry rebellion over his circumstances. The incarnating soul often carries with it these tendencies, to avoid confrontation or to stubbornly insist that change is not required. What happens when a human who has structured their life, their conscious life, to their comfort is faced with a conflict between the subconscious and conscious? The conscious memories are pruned and altered to the satisfaction of the soul, so the person can be living almost in a dream state, denying everything unpleasant and literally delusional about the future. But the subconscious, which never forgets and is aware of all, nags, as does the soul which likewise is aware. If you are having problems getting even a clue from crop circles, even when gazing at them with your mind cleared and willing to be receptive, the problem is not with the circle makers. The problem is with you. We have stated that humans will be divided into two camps as the Earth changes accelerate. Those who recognize what is happening and those increasingly in hardened denial. Denial is assisted, in fact only possible, because the conscious is pliant and can selectively forget or alter memories. What happens when someone prone to consciousness games sees crop circles or receives a telepathic warning from a UFO blitz? Rather than listen to their hunches, they angrily suppress them. Even should the government come out and announce the pending passage, the reality of Planet X nearby, these individuals are likely to simply forget they heard the announcement, or argue that some other meaning was intended. The Zetas mentioned increasing illness going into the shift. Now a mutated ecoli-strain (EHEC) which is resistant to current antibiotics is making the rounds in Europe http://www.belfasttelegraph.co.uk/news/local-national/uk/1600-hit-by-new-ecoli-strain-16007055.html Do the Zetas want to comment on the current outbreak? Germs are opportunistic and also mutate. As is known from frequent ecoli outbreaks in the US, this is also related to agriculture methods. Cattle are penned and fed corn, and thus their manure is concentrated and sustains ecoli growth outside of the gut. In a natural setting, the ecoli in manure quickly dies as the manure is exposed to the sun and air, drying and crumbling. Rain or water wash in the cow pens puts ecoli into the water system, often used thereafter to irrigate or water crop such as spinach or lettuce. Then the ecoli is in the stems and leaves of the salad! During times of drought, such as many parts of Europe are experiencing, water for gardens is drawn from atypical sources, thus ecoli within the cucumbers of Spain is not surprising. As always the extensive use of antibiotics in herd management can allow resistant germs to flourish. A return to more natural agriculture is the cure, but is unlikely to be adopted until after the pole shift. Western New England experienced a tornado that is rare for the region. Can we expect more of the same, and should prepare for this types of disasters? We stated that tornadoes would become more frequent, more intense, and appear in areas not previously subject to tornadoes. These predictions of ours, made in the past, were based on our knowledge that the Earth wobble would intensify and become more violent. Now that the wobble is rising to meet our predictions the tornado spates and surprises are likewise on the increase. This is certainly not going to go away. The wobble will continue to worsen, and problems with tornadoes will follow. Since you are going to have to live through hurricane force winds during the hour of the pole shift, our advice would be to prepare a storm shelter early, and use this during tornado weather. http://english.vietnamnet.vn/en/politics/8928/chinese-fishing-boats-violate-vietnam-waters--gov-t-mulls-patrol-boats.html In the last couple years, the Chinese government, and its navy has been harassing our Vietnamese fishman: attacking and kill our fishman, sink our boats and kidnapped and ask for ransom ; and all of these activities occurred in our sea territory, systematically and until now. Last week they destroy our equipment for exploring natural resources. They (Chinese navy) also attacking other countries in the South East Asia, violating other country's sea interests. My question is that: if the top Chinese leaders were in the know, like Zetas stated, knowing that the pole shift is coming, what is their purpose of expansion, harassing, provoking and violating our country (sea) and other countries in the region? We are a small country, and there is no match in this warlike, conflict with big power like China; what is the possible, we as Vietnamese, strategy for us to promote peace without surrendering our territory (sea)? Unfortunately, this type of activity will only increase as the Earth changes, and starvation, increase. Attempts to take from other groups will increase, whether they be another country, another corporation, another farmer, or a charity collecting foodstuffs for the starving. This type of strong-arming is nothing new. In those countries where the UN is importing foodstuffs for the starving, only a fraction of what is delivered by the UN arrives. If outright theft from the warehouses is not occurring, foodstuffs are wrenched from the hands of those who were handed a bag of rice. Nothing is done about these practices because the police are bribed with a portion of the take. Even without the certain conflict between survivor camps and looting gangs, these conflicts will exist on an individual level. One neighbor may simply come over and take another's cow or goat, or steal produce from the garden at night. Borders between countries will not be honored during times such as the coming pole shift, when the populace in one country presses forward into another country and the border guards are nowhere to be found. Governments will falter and fail, because all will be starving and many insane, and their ability to feed their military or civil servants will fail. Paper money will be worthless, and financial obligations ignored, and only the barter of real goods and food will matter. As with the continuing polarization of the populace, where the good hearted find each other and group together and leave the selfish to fend for themselves, these skirmishes will eventually wear down. There are many reasons for this trend. As with the Arab Spring, where Star Children are incarnating as walk-ins into those human bodies where no soul has sparked, such maneuvers can shift the balance of power. The selfish do not help each other, and thus broken machinery or boats are not repaired, nor are broken limbs. The selfish find themselves sick and dying, with their mates turning a deaf ear on their pleas. Good hearted farmers or fishermen may have to migrate and join other survivors to have the strength in number to be able to repel looting or take-over attempts. But eventually, only the good hearted remain!